Presentation of the photographic book Raptors of the Canary Islands in the Museo de la Naturaleza y el Hombre, Santa Cruz de Tenerife. The collaboration of GOHNIC members in this work has to do with the writing of three chapters on Canarian birds of prey, one of them the emblematic osprey. 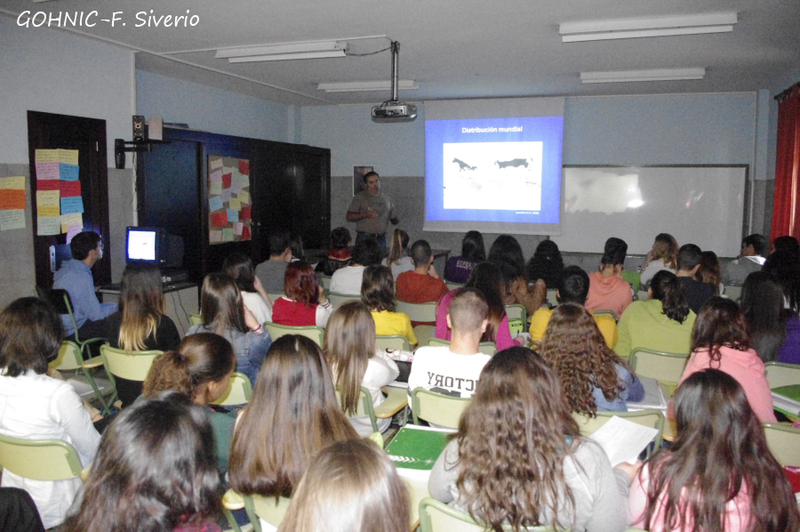 Lecture and group discussion on Shearwaters and petrels in the Canary Islands: ecology and conservation problems (Beneharo Rodríguez, GOHNIC) for pupils of the Biology and Geology Departments in IES Realejos (22 de octubre de 2014) and IES Cruz Santa (7 de noviembre de 2014). These activities which are included in the environmental program Los Realejos Actúa Verde 2014, sponsored by Los Realejos Townhall (Tenerife), are carried out by the Aula de la Naturaleza Rambla de Castro (ANRC-AFAVER). 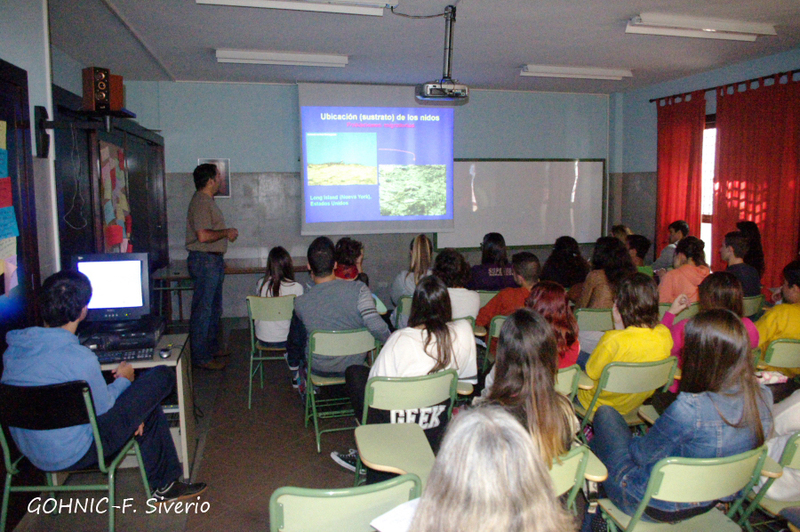 Lecture and group discussion on Population ecology of Osprey in the Canary Islands (Manuel Siverio, GOHNIC) for pupils of the Biology and Geology Departments in IES Realejos (30 April 2014) and IES Cruz Santa (21 May 2014). These activities which are included in the environmental program Los Realejos Actúa Verde 2014, sponsored by Los Realejos Townhall (Tenerife), are carried out by the Aula de la Naturaleza Rambla de Castro (ANRC-AFAVER). During the year 2014, the Aula de la Naturaleza Rambla de Castro (Los Realejos, Tenerife) relied on the scientific advice from GOHNIC for the carrying out several activities related to the study, dissemination and conservation of Canary Islands’ natural heritage. This is a project of the Asociación de las Artes Visuales y Escénicas de Los Realejos (AFAVER) co-financed by Los Realejos Townhall. 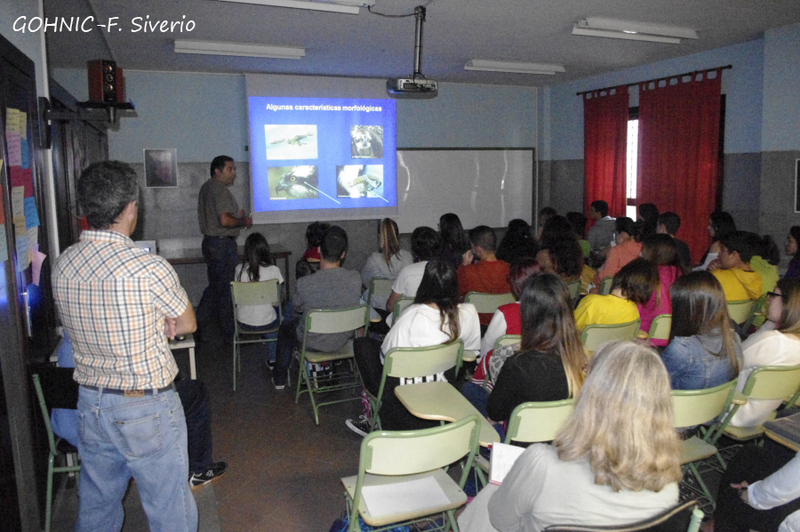 Lecture and group discussion on Ecology and conservation of Osprey (Pandion haliaetus) in the Canary Islands (Manuel Siverio, GOHNIC) for pupils of the IES Tamaimo-Santiago del Teide. Apart from telling them a bit about the situation of Osprey around the world, this presentation will also mention the last three decades of monitoring its threatened population in the Canaries, especially of the small colony established in Teno massif, in the north-east of Tenerife. Agreement of cooperation between the Excmo. Ayuntamiento de Santiago del Teide and GOHNIC. An Ornithological excursion to Isla Baja (Los Silos) guided by Beneharo Rodríguez (GOHNIC) in order to discover interesting aspects on birds, both sedentary and migratory, typical of the northwest coast of Tenerife. This activity which is included in the environmental program Los Realejos Actúa Verde 2014, sponsored by Los Realejos Townhall (Tenerife), is carried out by the Aula de la Naturaleza Rambla de Castro (ANRC-AFAVER).